The job of the copywriter is to create headlines that pop off the page, hook the reader and reel them into the first paragraph of your ad. (The first paragraph then inherits the responsibility of inspiring the reader to finish the ad). How important is the headline? According to the legendary adman David Ogilvy, FIVE TIMES as many people read the headlines as read the body copy. That means it is most likely your one and only shot to grab the reader. In a way, your headline is like an advertisement for your advertisement! It must be compelling -- and for maximum effect -- promise some kind of benefit. 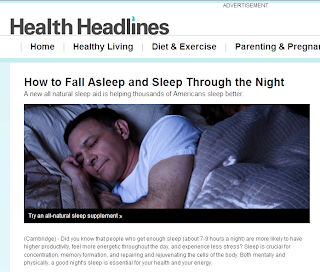 This particular headline, "One Bizarre Trick to Stay Asleep All Night", worked because it made a personal connection with me. Like I said, I have trouble sleeping and this headline clearly offered a benefit. (This headline probably wouldn't inspire a click-thru from those people who sleep like a drunk Koala Bear on Ambien... but those people wouldn't buy the product even if they did click-thru because the product doesn't pertain to them). This brings up an important point to remember... in copywriting, you obviously can't capture every reader, every time. The key is writing a headline that clearly identifies your target audience and then screams to grab their attention. So, in addition to making a personal connection with me, what else did the writer do to grab my attention and motivate me to click the link? The word bizarre got my attention and piqued my curiosity... which is the exact effect the author wanted, no doubt. I had to find out what was so bizarre. (As it turned out, there was absolutely nothing in the advertisement that qualified as bizarre. Click the link at the end of this post, read the advertisement for yourself and see if you agree. The product they're selling is simply an herbal supplement containing common ingredients such as chamomile that are believed to help regulate sleep, but hardly "bizarre"). 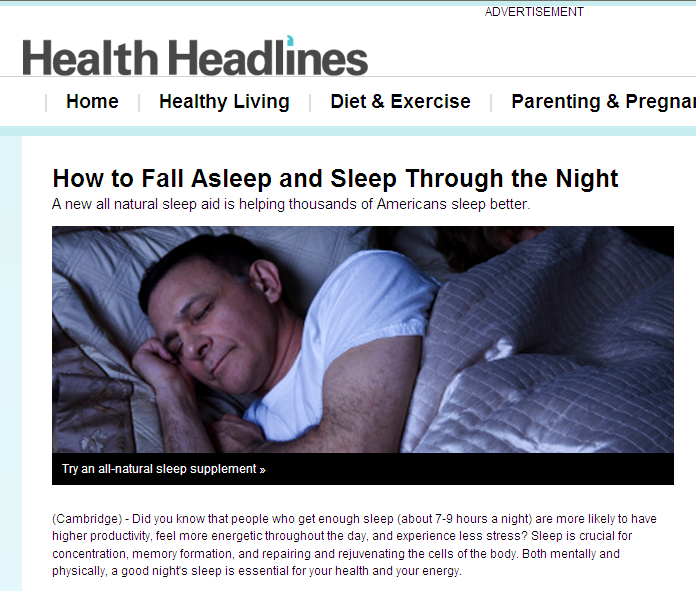 Lastly, the headline claimed "one trick" to make you sleep all night. This plays right into a basic human desire... we all want solutions that are fast, easy and convenient. After clicking on the link, I was taken to a webpage that looked like a blog (again, be sure to click on the link at the end of this post to see for yourself). This is an old Ogilvy technique known as an "advertorial"... an ad that looks like an editorial. The research shows that editorials get SIX TIMES more readership than ads. So why not make your ads look like editorials? David Ogilvy did it to perfection and became an advertising legend. As you will see, this ad follows the advertorial model. In fact, I didn't know it was an ad until I read the whole thing - I thought it was one of those Yahoo health articles. After looking at the article a second time, I noticed the word ADVERTISEMENT at the top of the page (which is required). Notice the article begins with the word CAMBRIDGE, which suggests the article may have been written at the prestigious Harvard University (in Cambridge, Massachusetts)... perhaps by a real scientist... perhaps not. Who knows? But it has a subliminal impact nonetheless. And finally... here's the link to the actual advertisement. Notice all the navigational links on the page... click on any one of them and see what happens. They don't take you to another page. They simply refresh the page (because it's not a real website, just a clever advertisement designed to look like one). This a great example of taking an old school advertising trick -- the "advertorial" -- and modernizing it for the "Internet Age". Have you tried making your ads look like an editorial? The word "ADVERTISEMENT" is not there if you're using an adblocker. So it *really* comes off as looking like an editorial. Also, I see you wrote "inconvient" and I know you didn't mean "inconvenient" but rather "convenient", right? Ha! Thanks for catching the typo! I fixed it. And thanks for reading my blog post! Just curious... how did you find it?